► British Columbia (Capital Regional District), Victoria — "Tomorrow Run 91"
In commemoration of Stephen Fonyo’s run across Canada to raise money on behalf of the Canadian Cancer Society, for cancer education, patient care and research. This building was constructed in about 1900 to served as a canteen where the off-duty soldier could make purchases from a limited stock, drink beer and relax. John Sebastian Helmcken was born in London in 1924. He trained to be a doctor at Guys Hospital, London. He arrived in Victoria as a surgeon and clerk for the Hudson Bay Company on March 24, 1850. ► British Columbia (Capital Regional District), Victoria — Emily Carr — Born December 13, 1871 • Died March 2, 1945 — "Our Emily"
On this site Rev. R.J. Staines and wife opened the first British Columbia School in 1849. In the same building of Fort Victoria the first Legislative Assembly met August 12th 1856. For many years, keepers tended this light. Now we tend the stories of the light. Pendant bien des années, des gardiens ont veillé à entretenir cette lumière. À présent, nous veillons à immortaliser les récits sur ce phare. Q: How do you move a 28-ton gun barrel up a hill? A: With great difficulty, and a "gun drug." [French] Les ancêtres de la famille Côté son arrives au Québec en 1634. En 1945, Joseph Napoléon Côté et son épouse Ida Camille Demers, accompagnés de leur fils Joseph Henri Côté et son épouse Anne-Marie Forcade s’establissent à Victoria. As the Helmcken family grew, so did this house. You can see three stages in the structure. Operating Lower Battery during an alert required discipline, precise timing and constant attention to safety. This historic fountain was originally erected near the turn of the century at the “edge of town” known as the Five Corners: Government, Douglas, Gorge and Hillside Streets. ► British Columbia (Capital Regional District), Victoria — Pendray House — 309 Belleville Street — Victoria, B.C. 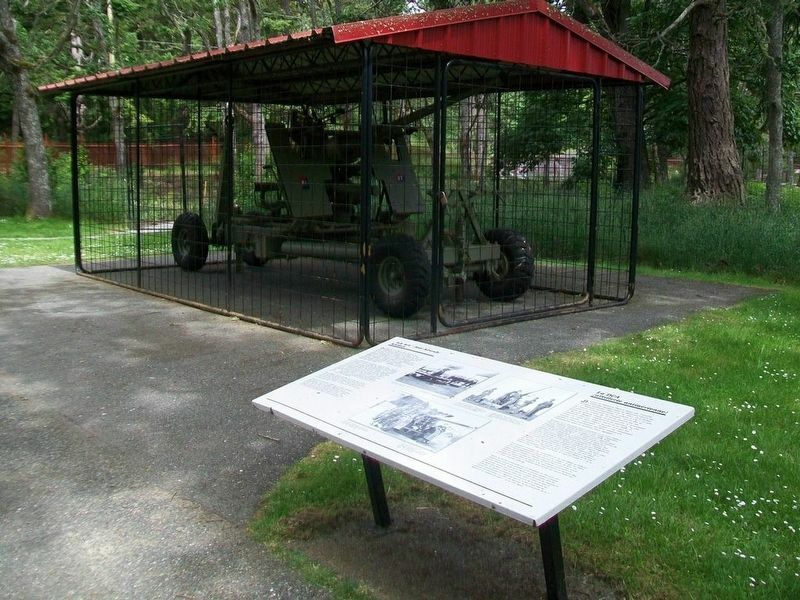 ► British Columbia (Capital Regional District), Victoria — Repository / Manoeuvre du "repository"
Moving artillery pieces from their mountings and moving the mountings themselves, was an awkward and potentially dangerous job for the gun crews. It was accomplished in a routine known as repository drill. ► British Columbia (Capital Regional District), Victoria — Right Reverend George Hills, D.D. This is one of the earlier brick warehouse in the area, replacing previous wooden construction. Sidney Pitts, like other businessmen on Yates Street, operated a wholesale grocery, provision and produce business. You are standing in Bastion Square. The Hudson’s Bay Company, whose legacy continues at the store on Government Street, established Fort Victoria here in 1843. A rowboat was the only link between lighthouse and land, and sometimes the only thing standing between life and death. In 1850, Marie Esther Blondin, now known as Blessed Marie Anne Blondin founded the Congregation of the Sisters of Saint Ann, a Roman Catholic religious order dedicated to education and nursing in Lachine, Quebec. This viewpoint illustrates the commanding position required for a coast defence gun battery. The trees in front were topped when the emplacement was in use. ► British Columbia (Capital Regional District), Victoria — The Victoria Centennial Fountain — Activated 2 August 1968 by Hon. W.A.C. Bennett, L.E.D.. Premier. Excavated from solid rock, this underground magazine provided a secure and dry storage area for ammunition. This building was constructed in 1897. It was built of brick to British Royal Engineer specifications and during its life it was subjected to several modifications. How did people navigate this coastline before lighthouses and GPS? 161 markers matched your search criteria.